Acute hamstring strains are a common injury in sports, especially with sports which involve sprinting. In sports such as professional soccer, current statistics show the frequency of hamstring strains in males to be up to 16% of all injuries (1). To understand a hamstring strain, one needs to be familiar with its anatomy. 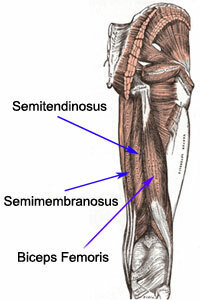 The hamstring muscle group, consisting of the semimembranosus, semitendinosus and biceps femoris, is a biarticular set of muscles that span the entire length of the posterior thigh. Originating from the ischial tuberosity, the hamstrings course inferiorly to attach to the proximal medial portion of the tibia (semimembranosus and semitendinosus) and the head of the fibula (biceps femoris) and act concentrically to produce hip extension, knee flexion and knee internal and external rotation, respectively, when the knee is flexed (2). The hamstrings also work eccentrically to decelerate hip flexion and knee extension, an essential motion for high speed running (3). Click here to see patient version of hamstring strain article. 1) Terminal swing phase of high speed running – Running related hamstring injuries generally occur along the intramuscular tendon and adjacent muscles fibers with greater incidence of injury to the biceps femoris long head (4). 2) Concurrent hip flexion and knee extension – Activities such as dancing or kicking can place the hamstring in an excessively stretched position most commonly causing injury to the proximal free tendon of the semimembranosus (5). Some common risk factors for hamstring strains are age, decreased hamstring strength, decreased hamstring endurance, poor hamstring flexibility, limited quadriceps flexibility, decreased strength and coordination of pelvic and trunk muscles, and inadequate eccentric hamstring strength to counteract concentric quadriceps action in terminal swing phase of running (6). Additionally, the recurrence rate of hamstring strain injuries is 33% with the second (7), typically more severe, injury requiring greater rehabilitation time than the first (8). Subjective: Sudden onset of posterior thigh pain from a specific activity, possible audible pop with proximal tendon injuries, possible pain at ischial tuberosity in sitting, painful muscle spasms, history of hamstring injury close to the current injury site (6). ¨ Strength: decreased strength and increased pain provocation with manual muscle testing of hip extension and knee flexion. High speed running injuries tend to present with more severe weakness. To isolate the more medial semimembranosus and semitendinosus or the more lateral bicep femoris, perform strength testing with the lower leg internally or externally rotated respectively. Testing of the unaffected leg for bilateral comparison as well as strength testing of proximal and distal joints to address potential causative factors is crucial (6). ¨ ROM: decreased hamstring flexibility and increased pain provocation with passive straight leg raise (hip) and active knee extension test. High speed running injuries tend to present with a greater ROM loss (6). ¨ Differential diagnosis: Adductor strains and adverse sciatic nerve neural tension are two additional common causes of posterior thigh pain. It is important that the examination rule out these two conditions (6). The primary goal of therapy is to return the patient to their prior level of performance with minimal risk of injury reoccurrence (6). Early stage: The focus should be to minimize pain and muscle atrophy, decrease edema, protect scar tissue formation, improve neuromuscular control and enhance lumbopelvic strength (6). Middle stage: The stage is initiated once the patient can walk normally and without pain, tolerate very slow speed jogging without pain and perform a pain-free submaximal isometric contraction. The aim of this stage is to increase range of motion and muscular control (6). • Therapeutic exercises: neuromuscular control, transverse and frontal plane agility drills and trunk stability exercises with a progressive increase in speed and intensity (9). Submaximal eccentric strengthening in the mid-range of the muscle is targeted through functional movement patterns versus exercises that isolate the hamstring. Sports specific movements that avoid full lengthening of the hamstring muscle are also initiated in this stage and are progressed to incorporation of sagittal plane movements (6). Final stage: Patient can progress to this stage of rehabilitation once they can achieve a 5/5 maximal effort isometric contraction while prone with knee flexed to 90° and jog backwards and forward at 50% maximum speed without pain. This stage focuses on aggressive sports-specific movement with no restriction on ROM to return to prior level of function (6). The patient can return to sport once he or she has achieved full ROM, strength and function without any complaints of pain or stiffness (6). 1) Croisier J, et al. Strength imbalances and prevention of hamstring injury in professional soccer players: a prospective study. Am J Sports Med. 2008;36:1469-75. 2) Neumann DA, Kinesiology of the Musculoskeletal System: Foundations for Rehabilitation. 2nd Edition. Mosbey, 2010. 4) Thelen DG, Chumanov ES, Hoerth DM, et al. Hamstring muscle kinematics during treadmill sprinting. Med Sci Sports Exerc. 2005;37:108-114. 7) Orchard J, Best TM. The management of muscle strain injuries: an early return versus the risk of recurrence. Clin J Sport Med. 2002;12:3-5.